Today, we’ve got a double dose of loveliness from not one, but two amazing photographers, Britney Clause Photography +Marlayna Photography with this Serenity+Cobalt Inspired Styled Shoot at the Patapsco Female Institute! From the photographers, Britney & Marlayna: “We came up with the idea of collaborating on this styled shoot after gravitating towards a common vision that would speak to couples in love with bold, Serenity-inspired hues for any season. 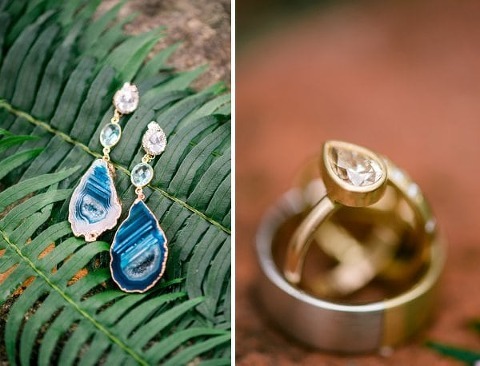 We wanted to balance shimmering geodes and vibrant blues with clean lines and soft watercolors. 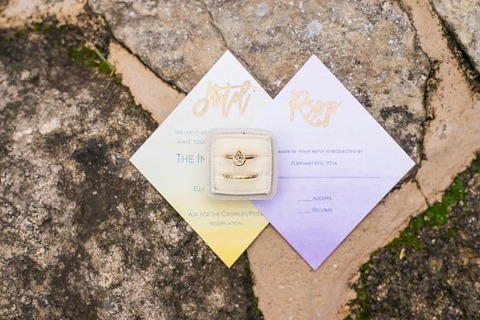 The Patapsco Female Institute was the perfect venue, with its romantic architecture – including bright walls, raw stone, and its unique roof-less spaces – it is a venue with a lot of versatility and plenty of gorgeous light. The venue’s beauty was brought to life by this palette’s deep blues and purples, and the striking textures of our geode accents. The table was set, with fantastic details from local vendors, including rich florals and bold cobalt glassware. Even the table is an impressive work of art in itself, hand-made of naturally beautiful raw textures. 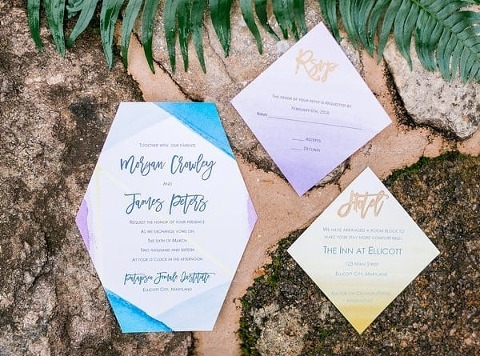 Gold flatware and sweetly DIY-ed ombre napkins play off of the soft hues and fun shapes of our watercolor invitations. And who wouldn’t want to find their seat with a geode-table number? We were thrilled to even have food to fill the plates with delectable and appetizing dishes from Copper Kitchen. Their signature dish, the CK Donut Burgers were a huge hit, accompanied by a Passion and Spice cocktail. For dessert, we had tiers of rock candy cupcakes that enticed the senses with their sweet aroma.